Madison is an obscure and mysterious Dark Horse Comics character. 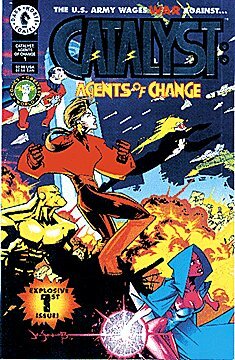 He appeared in the Comics’ Greatest World setting (now Dark Horse Heroes), a 1990s attempt at creating a new major super-heroes line. This profile may be best read after the Grace character profile, since Madison exists in a specific corner of the setting. Height: 5’10” Weight: 200 lbs. Although he looks tough and husky, Madison is actually a telepath, not a physical type. His mental might may not be massive, but he has access to specialized hi-tech equipment. It helps with his most feared ability is that he can destroy memories. He can do the “man in black” stuff real well, too, and seems quite experienced with spook work. While Madison makes an OK leader in a pinch, it’s not his strong point and he knows it. He’d rather be a good consigliere, staying in the shadows and handling delicate cases, preliminary negotiations and secondary objectives. Madison is rumoured to have worked for the US Intelligence community for a few years. He’s Grace’s right hand man, and the only person informed of most of Grace’s plans and actions. He often is her adviser. When Grace disappeared after a fight against the power-mad Titan, he took charge of Golden City and the Agents of Change. But Madison lacked Grace’s unique presence and faced dissension in a time of crisis. But his efforts and the Agent’s victory over escapees from Golden City’s prison kept the team in focus. Madison tried to support Law when he appeared, thinking him to be the best option for Grace’s succession. That was a grave mistake – Law shot him in the head before having the whole Golden City council executed by two guards. Law then killed the guards with his bare hands. It is possible that Madison somehow survived the shooting and resumed working for Grace when she returned. Madison is an older, smooth operator. He demonstrated calm charisma and the authority of experience. He’s a bit cynical and pessimistic, in contrast with Grace’s peculiar brand of idealism. When in charge, he drives people to their maximum and will be quite harsh about any mistake. Hypnosis can only be used to delete memories, and these might eventually resurface as the conditioning wears off over the years. Area Knowledge (Golden City), Credentials (Golden City, High). Agents of Change (High), Grace (High), US Government (Low). If there is a risk of physical combat, Madison will wear a black and grey ballistic suit taken in the Golden City Militia’s arsenal [/BODY/ 08]. He often uses special equipment ; examples have included a machine enabling him to trigger and monitor dreams in an unconscious subject to see his mores and fantasies, and one that somehow allowed him to monitor the whole combat zone around Golden City while besieged by the US Army.